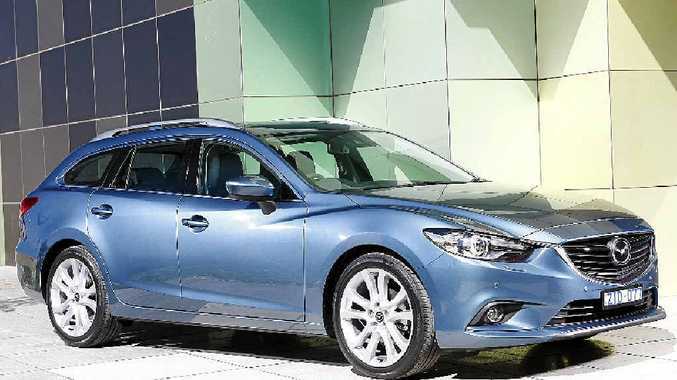 HARD TO FAULT: The Mazda6 diesel wagon is a pleasure to steer. MAZDA continues to woo the Australian public with sales figures this year already outpacing the success of 2013, keeping the manufacturer firmly among the top four brands in the country. Of course, the Mazda3 has been the big winner, a fact that will be strengthened with the arrival of the diesel in September, but there has also been a keen interest in the CX-5, the BT-50 and, of course, the Mazda6. The last-named, both in sedan and wagon form, has managed to attract a rather wide and varied audience, thanks much in part to its arresting good looks, very capable performance and top-notch technology. It is proving to be a value-for-money proposition and this mid-sizer is charming its way into the garages of very satisfied drivers. There is much to cheer about inside the Mazda6 with a stylish cockpit and above-average materials the order of the day. The curves along the dash and instrument binnacle echo the exterior design and add interest while the buttons and dials are within easy reach of the driver. Mazda has shown restraint here, opting for an uncluttered palette with satin-metallic highlights to introduce polish. The steering is nice to the touch with controls placed in a way that makes sense, while the instruments themselves are clear, concise and easy to read. Quality varies on instrument and dial surrounds, however, with obviously cheaper plastics doing duty next to soft-touch stuff. We like that the sat nav system is integrated into the dash and not perched on top as with some competitors. The TomTom touch-screen is easy to navigate with good graphics. Legroom is excellent, headroom suffers a tad because of the sporty low stance and the seats, while fairly comfortable, could be a touch more supportive. There are plenty of useful storage options throughout the cabin and the 451-litre cargo area - 1593 litres with the seats folded - is handy. It is hard to fault the 2.2-litre twin turbo diesel that powered our test car. Paired with a slick six-speed automatic gearbox, it proved to be a slick no-nonsense unit that happily exceeded expectation. The diesel clatter on start-up soon mellows out and odds are you will be too busy revelling in the Mazda6's prowess to even notice it. Power, as you would expect, proves no problem even through steep mountain climbs and on the flat, too, it barely works up a sweat, accelerating with ease with just the slightest urging. Handling is good too, almost effortless in fact, and the wagon is nimble in and out of tight corners as well as tight spots. Mazda's Skyactiv fuel technologies, including the seamless i-stop and i-ELOOP which saves the energy lost during braking, are a boon here and combine perfectly with a lighter, more rigid body and a lower compression ratio to deliver a very impressive drive. Mazda's inclusions list strengthens its value-for-money bottom line and our Touring wagon - just one up from the entry-model Sport - was certainly not left wanting. Among its riches it boasts 17-inch alloys, leather trim keyless entry with push-button start, dual-zone climate control, auto headlights and wipers, Bluetooth hands-free and audio, Bose sound system with 11 speakers, power-adjustable front seats, sat nav, reverse camera and parking sensors. Safety features include six airbags, anti-lock brakes with EBD and brake assist, stability control, hill launch assist and emergency stop signal. Our test car had the optional safety pack fitted, adding blind spot monitoring, rear cross traffic alert, smart city brake support and rear view mirror with auto-dimming function. Rivals include the Hyundai i40 Tourer (from $34,490), Ford Mondeo wagon (from $37,340) and Skoda Octavia 103 TDI wagon (from $35,990). With good looks, sporty personality and excellent technology the Mazda6 wagon will satisfy the needs of a large demographic. The easy drive and spacious interior won't hurt matters either. Official figures stand at 5.4 litres/100km and while we hovered closer to 6L/100km, fuel consumption was still impressive. Mazda offers a three-year unlimited-kilometre warranty. Service is annual or 10,000km. With its mix of luscious curves and well-placed straight lines the Mazda6 doesn't have to work hard to catch the eye or excite the imagination for that matter. Its low-slung proud stance adds to a sporty edge and there is a certain poise and elegance in the detail. The Mazda6 embraces the manufacturer's Kodo design theme and it is easy to see the beauty of an animal ready to pounce. We have always liked the Mazda6, sedan and wagon, and this addition serves to reaffirm that pleasure. This is a good car featuring all the niceties we have come to expect from modern-day offerings and should definitely be on the top of your list should you be shopping around. What we liked: Sporty looks, spacious cabin, easy drive. What we'd like to see: A little more cargo space, improved bolstering on seats. Warranty and servicing: Three-year unlimited kilometre warranty, with an extended warranty available at purchase. Servicing is every 10,000km or annual and capped price servicing will soon be available across the Mazda6 range similar to what is available on Mazda3. Details: Four-door front-wheel-drive medium wagon. Engine: 2.2-litre, four-cylinder, twin turbo-diesel generating maximum power of 129kW at 4500rpm and peak torque of 420Nm @ 2000rpm. Consumption: 5.4 litres/100km (combined average). Bottom line plus on-roads: $41,650.